Dancers often practice for hours each day doing the same movements repeatedly in order to prepare for shows. Dancers who perform for Broadway or other dance companies may perform up to eight times per week. Long practices coupled with little rest time in-between shows can mean that dancers often become injured. 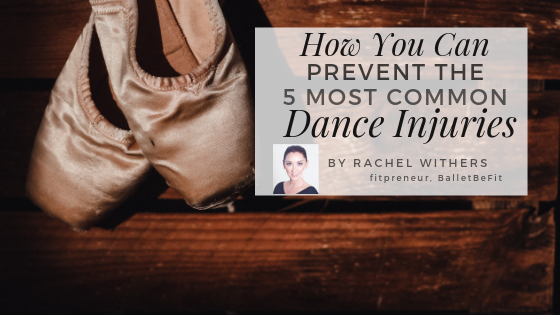 Prevent these five common dance injuries from occurring with a few helpful tips. Cartilage is an important structural component in the body that covers the surface of bones where the joints meet. It is firm, but softer than bone, which allows some movement and flexibility while cushioning and stabilizing the joint. If a joint is forcefully twisted, it can cause the cartilage to tear. Strengthening the muscles and joints sufficiently before dancing can help prevent cartilage tears. Ankle sprains are one of the most common dancing injuries. Sprained ankles occur when movement forces the ankle outside of its normal motion range, causing the ankle ligaments to become stretched or torn. Strengthening the hips and thoroughly stretching the ankles prior to dancing can help prevent sprains. The tendon in the back of the ankle that connects the calf to the heel can become inflamed when overtraining occurs. Perform on hard floors prior to warming up properly can also be a culprit. Properly strengthening the quadriceps muscles through exercise and stretching the Achilles tendon prior to dancing can help prevent this injury. Though the “snapping” noise that accompanies this syndrome may just seem like an annoyance, it can soon turn into tightness and pain throughout the hips if not addressed right away. Snapping hip syndrome occurs when the iliotibial (IT) band is too tight and the muscles on the outside of the hip are weak. Strengthening the glutes and stretching the hips and legs prior to dancing can help reduce the tightness. The lower back is responsible for helping dancers elevate their legs and perform high leaps, which means it’s susceptible to injuries. Arching the back when the pelvis is pointed down can compress the spine and cause painful back spasms to occur. To prevent back injuries, core strengthening exercises should be performed regularly in order to help support the spine. Proper training, stretching and resting as much as possible is critical in order to prevent the most common injuries that occur in dancers. If an injury does occur, see a medical professional as soon as possible in case it is indicative of a more serious condition.